It may seem like a silly kind of topic to talk about, but don't worry about that. In Toastmasters, we are safe to try almost anything in terms of topics, and see how it works out. I like to try interesting things like this, to see where it takes me. 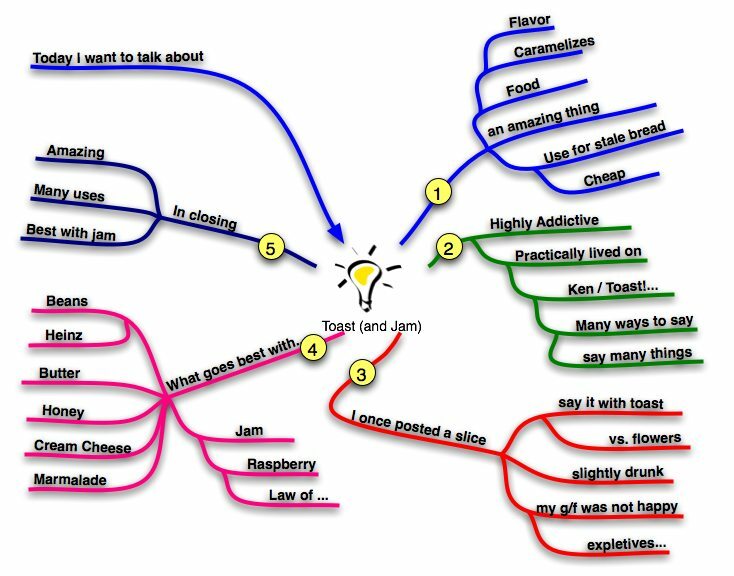 I use mind maps to write most of my speeches. They are most effective for creative thinking and then later organizing your thoughts into a logical speech outline. You start from a central point and branch outwards, using both pictures and text. In the earlier days I would have a flip chart pad attached to a wall, and draw mind maps by hand. These days I use a drawing program to make my mind maps on the computer. You can see I numbered the main branches, which indicates the sequence I would present. That is actually done at a later stage. It frees you up when you are thinking of ideas to include, because you don't have to think about the sequence you will present at that time. You are not stalled wondering what would be the first point, the second point, etc. It was interesting to see how much I knew about something so simple as toast. I am sure there is more, I stopped when I had enough for a speech. Item 3 is a story how I sent a slice of toast in the mail to my girlfriend at the time (I was drunk) and she was not amused.